ezine,magazine and e zines,free ezine: April 15, 2005 Issue! It is trust and communication that sells products and services on the Internet. But how can you earn your website visitor's trust? You must get comfortable with your own unique style. By genuinely presenting yourself as you are through your website, your emails and forums you are entering into the hearts of people. Trusting you and respecting you will become their moral need! The customer hears you with their eyes! It is the written word that has the most impact on your website. Think of your website as you and then begin the process of building it. Pay particular attention to what you write. It should communicate the inner you to the visitor. The bottom line is, chose right words and then communicate honestly laced with a purpose. The magical power in you and your website will come alive giving you more sales and more customers. "New Marketing Dashboard Lets You Point-And-Click Your Way To Sales And Profits, Step By Step From A to Z! If you've been following Internet marketing for any period of time you've noticed that the rate at which new products come out is almost like a fireworks show. Everyone sits back and goes "ooh and aah" and buys the latest, hottest and greatest new products, but it's easy to feel confused or overwhelmed -- and in the end you can't decide which model to follow, or what the heck to do! There's only 1 system that boils down what you need to do and how you need to do it into a simple "point, click and follow the steps" system. 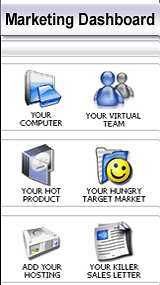 It is "Marlon Sanders' Marketing Dashboard"
them make money, but how many models do you really need? The answer is, you need 1 that works. and oldest models, which is to find out what people want to buy, get it or create it, then promote it and profit from it. something done or need to get a product out or you wish that some day the ebooks you bought on Internet marketing would somehow magically turn into money or if you're frustrated waiting for your search engine pages to finally, maybe, possibly get some darn traffic, then maybe it's time you stopped making excuses and just get it done. Dashboard = Step by Step, How To Get It Done! carefully planned out your idea? 2. Have you sent your idea query pitch to magazines or newspapers who may be interested? or will you write "on spec"? With many magazines and newspapers now accepting material online it is now possible in many instances to email your queries directly to the publication. Have you read the publishers guidelines carefully to make sure if this method is acceptable? the best time to send your query? If you have answered yes to these questions then package your idea into an attractive proposal and send it off to the editor of your chosen publication. 3. Have you adequately researched your topic? sources - bookstores, newspapers, libraries and internet sources. Never discard anything about your subject topic since you don't know until you write it up what you may actually want to use. Tip: Saving magazines, newspapers and clippings for the subject matter can save time when researching future writing assignments on the same topic or when working to deadlines. Catalogue all your collected material for easy reference. 4. Have you interviewed the key person/people you need for your proposed feature? 5. Have you discarded everything in your research except for factual information? True research and liberal use of factual material gives an original perspective to your feature article and also avoids the possibility of plagiarism. 6. Have you checked and cross-referenced your facts amongst your various sources. 7. Have you decided on the length of the article? Have you checked the length is suitable for the publication you are sending it to? Tip: Do not waste the editors time by sending a 2000 word article to a publication that requires articles between 500-750 words. 8. Will you use quotes in your article? Quotes and anecdotes bring a story to life. Are the quotes from a reliable source and have you double checked that quotes used are accurately recorded? 9. Do you have a good lead, middle and ending? 10. Have you proofread and edited your article to achieve the best possible version through re-writing your drafts to arrive at your final version? Have you made all corrections and necessary changes, have you checked spelling (this includes people and place names) grammar, punctuation etc? 11. If the feature is to be visual - have you provided the appropriate photographs, art work, line drawings, or other graphic illustrations to compliment your feature? This increases the payment amount you can expect to receive if you are a feature photojournalist or travel feature writer who can offer original photographic perspectives of your subject topic. 12. Have you included everything in your envelope before sending your article to the publisher (including photos properly packaged) or, if the magazine or newspaper excepts online submissions have you given everything a final check before hitting the send button? to a thriving web-based business. Search Automator: In this information-crazy society, there are a number of people and businesses whose success largely depends on information - finding it, consuming it, packaging it, and/or selling it. And you can certainly capitalize from this craze the easy way. And Search Automator will take you miles ahead. Make No mistakes in understanding this basic concept. Rank Retriever: This software is designed specifically to help marketers with the time consuming task of finding, approaching and managing link partners for better search engine rankings. You can find hundreds of potential link partners with high page-rank. A great tool to use if you are a serious marketer. 1. Net Snippets -: This is a unique tool to address the needs of researchers, students and individuals who rely heavily on the Internet as an information source. Net Snippets provides you tools to clip, annotate, edit and manage information found on the web without leaving the comfort of their browser interface. You can easily collect entire pages, links, images, and parts of web pages and store them. 2. The Business Case for RSS - : RSS is a tool misunderstood by most marketers and it's potential to power the entire internet marketing mix cannot be ignored anymore. RSS is not the solution to all of our problems, but it is the one tool that can have the most profound affect on our internet marketing and business results in 2005 and beyond. Here's an excellent work by Rok Hrastnik that is specially designed for newbies to RSS as well as the experienced. Well. That sums up the first fortnight of April-2005. Do not Forget To Rate 'HomeBiz-Tips'. Your valuable vote helps us to improve this E-Mag as well as allow us to keep it Ad-Free.